Brown hamburger in skillet. 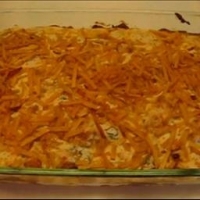 Place cooked hamburger in a 1 1/2-quart casserole dish. Mix soup and water together. Pour over hamburger. Top with 1 package Tater Tots. Bake at 400° for 45 minutes. Serve. This is a quick main dish.